You can't help but love the old sailing ship classic lines of this old Thursday Island Pearl-er. 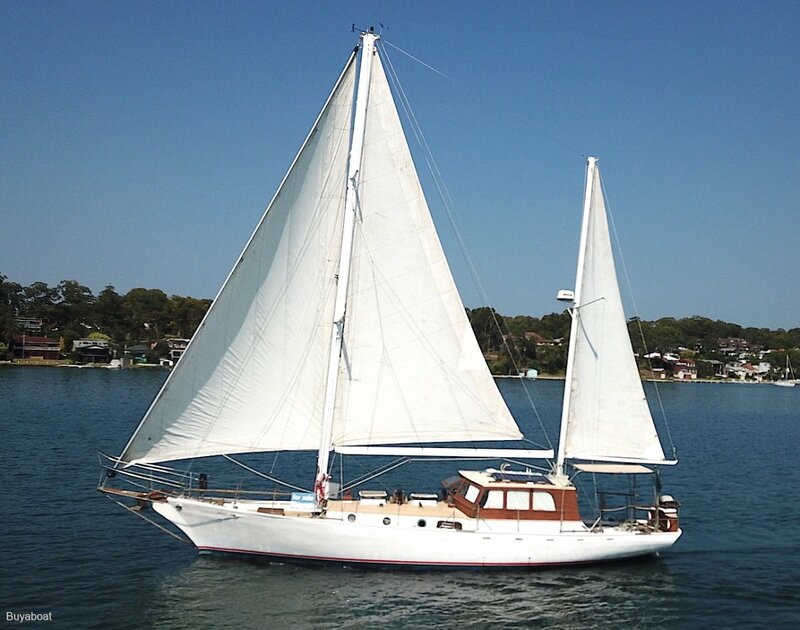 Built by Boat builder Bob Gordon of Sydney from Spotted Gum stripped planks, with teak interior. She is a beautiful solid boat. This is a boat that turns heads at sea, has heaps of room on deck. When you go aboard she is spacious, with heaps of entertaining, sleeping and cooking spaces. Full length with lead ballast. Timber Spotted Gum stripped planked. 48 Hp fresh water cooled. 525 L stainless steel tank. 1 x 500 L, 1 x 1000 L both stainless steel. Port side galley, with Gas stove, 4 burner hot plates, oven and grill. Large top and front load Fridge/freezer. Yes 240 V and engine. V berth 3/4 berth and double starboard side. Electric pump with hand basin and cupboard storage. Electric Muir anchor winch, plough anchor, 50 m Chain and 100 m rope, fenders and lines. 6 Life jackets, EPIRB, V sheet, 2 Fire extinguishers, 1st aid kit. Torch, flares, fire blanket. 3 Auto bilge pumps, midships, aft and shower. B+G autopilot, Chart Plotter, Sounder and Radar. GMC VHF radio and 27 mhz. Lazy jacks fitted on main. Boat mooring hook, boat swim ladder, fishing rocket launchers, Webber BBQ.